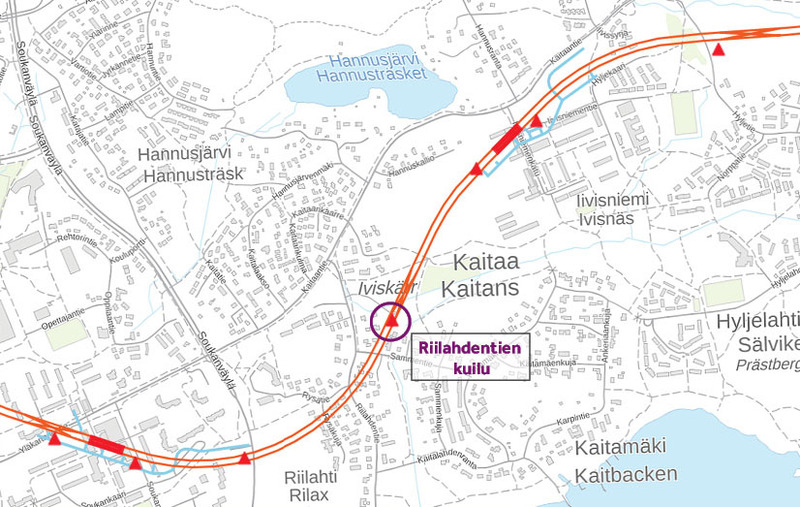 During Easter reinforcement work will take place as part of Länsimetro’s Kaitaa construction contract. On Good Friday, 19 April, and Easter Monday, 22 April, quiet work phases will be carried out between 9 am and 6 pm. On Saturday, 20 April, construction work will be carried out between 9 am and 6 pm, and the resulting indoor noise level will be no more than 35 decibels. We apologise for any inconvenience caused by the construction work. During Easter, boarding and reinforcement work, as well as installation of prefabricated elements, will take place as part of Länsimetro’s Kivenlahti construction contract. Vili Korhonen (MSc. Engineering) has started as war room engineer on the West Metro project. Korhonen’s tasks are to keep track of the project schedule and produce up-to-date information for decision-making purposes. In 2018, a ‘war room’ was created as part of Länsimetro’s big room to track not only the project schedule, but also project costs, quality and occupational safety. Korhonen works in the war room along with another schedule engineer and the war room manager. Korhonen will graduate from Tampere University of Technology in April 2019 with a Master’s degree in industrial engineering and management, minoring in electrical engineering and renewable energy production. “My studies combine the traditional disciplines of engineering and commercial sciences,” says Korhonen. He did his thesis at Merima Oy, a company that provides interior solutions for cruise ships, and has held summer jobs with Sweco PM, at their Ilmala location. “When I heard about the possibility of joining the West Metro project, I immediately thought, what an interesting opportunity! I expect to learn about project management, and I’m interested in seeing how a project of this size, with so many moving parts, is managed. For instance, there are a lot of subcontractors involved, and their schedules need a lot of reconciling,” says Korhonen. During his first days on the job, Korhonen will familiarise himself with the project and learn about the special characteristics of tunnel construction. “I believe it’s important to also gain an understanding of the concrete aspects of what happens on the worksite in order to help ensure that the project stays on schedule and meets the targets,” he stresses. He is pleased with the atmosphere surrounding the project. Sheet piling will be dismantled at the Iivisniemenkallio entrance to the Kaitaa station, and rock drilling will take place starting the week of 8 April for a total of two weeks. Sheet piling is a support structure that is removed as construction progresses. The work will cause noise during the day. Work that generates noise will be performed from Monday to Friday between 7.00 am and 6.00 pm. at the Kaitaa station. We apologise for the inconvenience. A glass wall is being built on the bus terminal level at the Matinkylä metro station between March and May 2019. The addition of the wall is intended to enhance patrons’ enjoyment of the shopping centre. The wall is being built in two phases in the area between the K-Market and R-kioski: During the week of 1 April, the barriers from phase one on the K-Market side will be dismantled and erected on the R-kioski side. The work will last a total of roughly nine weeks, with the project being completed in May. The work is being carried out during the day, starting at 7.00 am. The project involves building three sliding doors and two swing doors. The sliding doors will function with motion sensors. During construction of the second part of the wall on the R-kioski side, HSL’s ticket machines will be temporarily relocated outside of the construction zone. Once the work is completed, the ticket machines will be returned to their original locations. The Travel Card readers will remain in the same place, at the top of the escalators. The arrangements will not affect bus traffic at the terminal. The route from the bus arrivals terminal to the metro will remain the same, and passengers who are switching transportation methods will not have to bypass the worksite area. Materials for the project will not be transported to the worksite during rush-hour periods. The work is being carried out by Hermanns Oy, Are Oy and Rakennuspalvelu Heino. Länsimetro owns the stations of the Ruoholahti–Matinkylä section and is building the metro from Matinkylä to Kivenlahti. 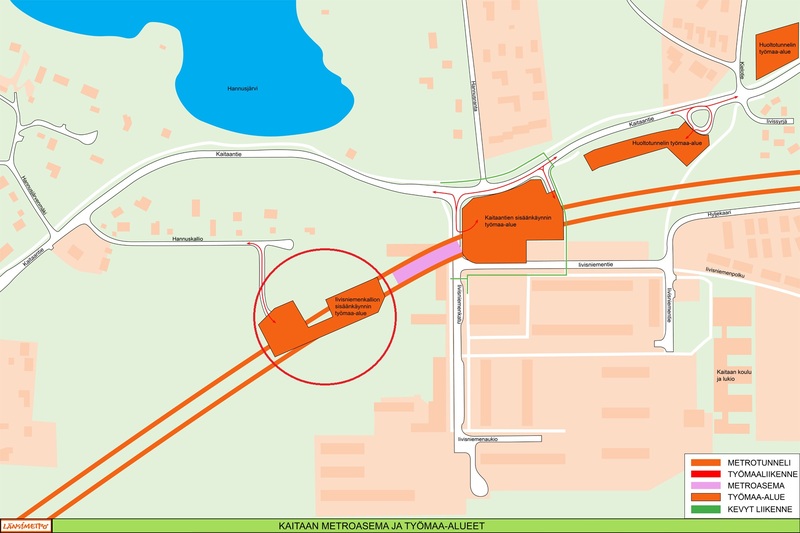 In the West Metro rail line construction project, the construction of the emergency exit and the smoke extraction shaft will begin with the Riihilahdentie shaft in Kaitaa. During the installation stage of the prefabricated elements, prefabricated stairs, stair slabs, columns and wall elements will be installed in the shaft over a total height of eight floors. The installation work will begin in the week starting 25 March 2019 and will continue until 31 July 2019. Prefabricated elements will be delivered to the site at a rate of two loads per week at 7 am. In addition, concrete mixer trucks will deliver fresh concrete for the casting once or twice a week. Cranes will mainly be used outside the period of 7 am–3 pm on weekdays, and passenger cars and vans will otherwise be used for site traffic. Once the installation work has been completed, construction will continue with work on the aboveground structures of the shaft. Work at the shaft will be carried out from Monday to Friday between 7 am and 6 pm. Diamond sawing work will be carried out in the Matinkylä service tunnel between 26 March and 5 April 2019. The work is connected to the construction of the Tynnyripuisto area. The work is scheduled to begin on Tuesday, 26 March, at 7.00 am, and will take place between 7.00 am and 4.00 pm. The noise caused by the diamond sawing may carry all the way to the metro platform. Concrete casting at the Espoonlahdentori entrance of the Espoonlahti metro station will be carried out during the week of 25 March as part of the construction of walls for the west entrance. The work is scheduled to begin on Thursday, 28 March, at 5.00 am and will be completed on Friday, 29 March, between 4.00 am and 7.00 am. The casting work is a long process, and unfortunately late-night work cannot be avoided; due to the height and size of the structure, the pouring of concrete must be completed in one go. The driving of concrete trucks and pumping of concrete may cause noise. We apologise for any inconvenience. 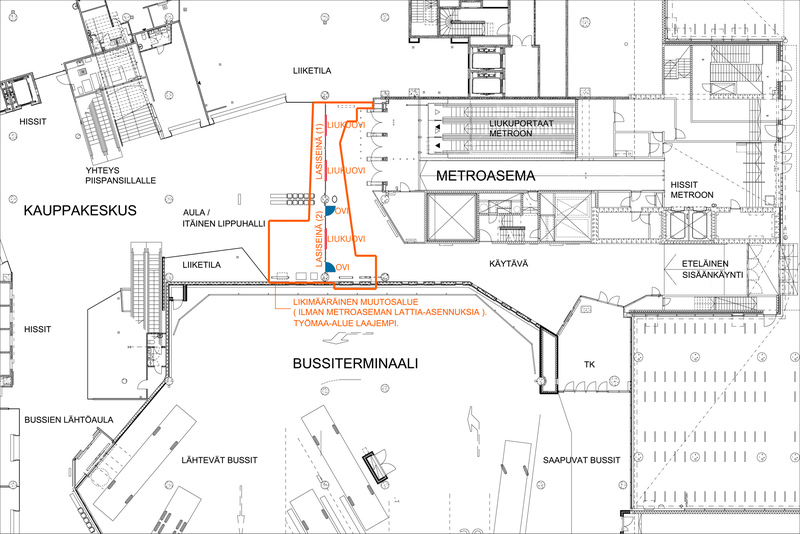 Construction at the Kaitaa metro station is proceeding, and construction work on the Iivisniemenkallio shaft will increase starting the week of March 18th. The Iivisniemenkallio entrance shaft is still provisional. A large truck-mounted crane arrived at the entrance to the worksite on Thursday, 21 March. The shaft’s weather protection will be dismantled. Concrete-truck traffic near the site will increase due to the construction of the concrete structures, and a tower crane will be set up at the worksite. In addition, aggregates will be transported within the vicinity of the worksite, and prefabricated elements will be delivered to the site. Rock anchor drilling will take place inside the entrance shaft. Work at the site will generally be carried out from Monday to Friday, between 7.00 am and 6.00 pm. Heavy traffic is routed from Kaitaantie to Hannuskalliontie, and from there to the worksite area.